Bargain Boutique offers re-use and recycling of all goods. We pass our unusable goods on to Multiple Sclerosis Society where further recycling takes place. Monday through Saturday, 11:00a.m. to 4:00p.m. We welcome you to Bargain Boutique Fine Thrift & Gifts for all your shopping needs! We are the only not-for-profit thrift & gift store in Quincy. The Plumas District Hospital Volunteers are happy to serve you. We have been in business since 1982 and are known for our unique shop and friendly service. Our service will surpass your expectations. We accept clean donations of household items, including furniture, and clothing and jewelry, for the family and offer a tax deductible receipt. Please care about Plumas District Hospital, because it is there to help our community, and this includes You. 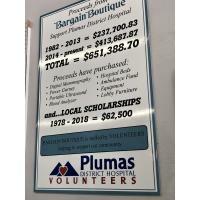 To promote and serve Plumas District Hospital by providing service and funds to assist in providing adequate care in hospital. Special Sales are offered. There's always 'Laurie's $1. Rack' and two tag colors are 50% off all the time. Storewide sales are held monthly for 3 days at a time. 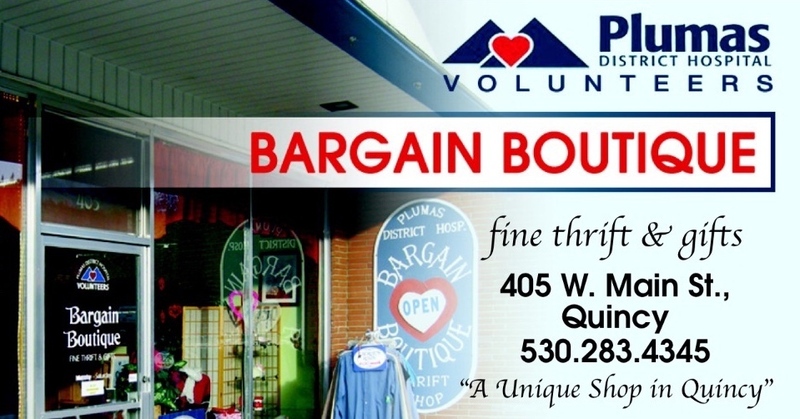 PDH Volunteers Bargain Boutique Fine Thrift & Gifts. Store hours are 11 a.m. to 4 p.m. Monday thru Saturday. WE ARE CLOSED ON MONDAYS FROM JANUARY THROUGH MARCH, REOPENING ON MONDAYS IN APRIL. 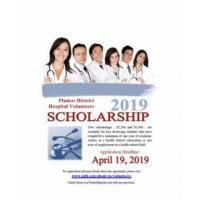 One $2500 scholarship and one $1500 will be awarded (in 2 payments) for the 2019-2020 year. Applications are available Thursday, February 19, 2019 and must be postmarked no later than Friday, April 19, 2019. Applicant must have completed a minimum of one year of academic studies or employment in a health related field. Gloria BOLAND, Chairman, P.O.Box 651, Quincy. Applications are available at www.pdh.org Click on "volunteers" and "scholarship. Applications will also be available at Bargain Boutique fine thrift & gifts, 405 W. Main St, Quincy. Qualifications listed on application.